The one or the other non-astronomy may have asked the question of what fixed stars are, a topic oft discussed. This question is one, which we would like to answer today! Fixed stars, a term that comes from Latin stellae fixae, are stars that appear to remain in the same position as compared to others in the night sky, possibly making up constellations. To our eyes, the stars don’t move – they remain in fixed positions and create a so-called fixed-star night sky. However, over thousands of years, we would be able to see movement in the stars. As a matter of fact, the night sky 50,000 years ago looked very different than today. Even if we don’t realize the change, we can still see something totally different. A fixed star moves across the night sky to the west. These stars stride across the astronomical meridian each day about 4 minutes earlier than the day before. Within a month, the distance can be quite considerable. Within three months, the difference in time is six hours. The difference in the night sky is then much easier to see. The Earth orbits the Sun once in 365 days, traveling 940 million km (584 million miles). The Earth is our space ship, out of whose window we discover different areas of the night sky. That’s why our so-called fixed-star night sky appears different during the summer than in Winter. That is also the reason, why we speak of typical Spring, Summer, Autumn or Winter night skies. The fixed-star sky, then, refers to the night sky that we can see during the evening hours during every season. 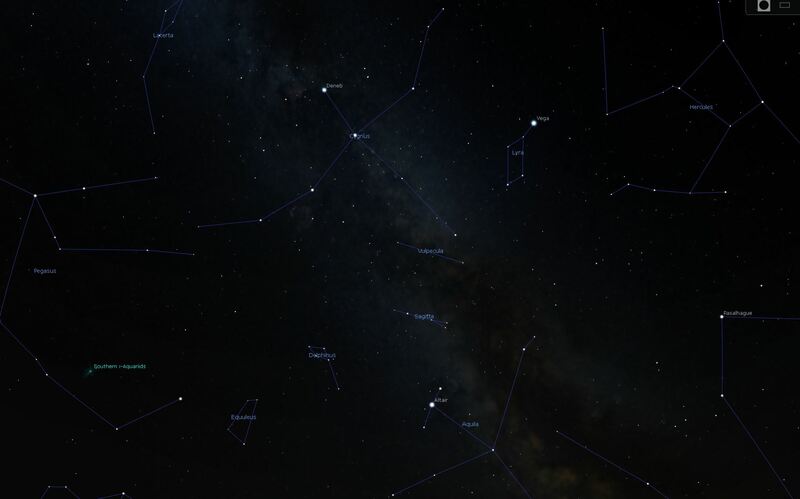 This Summer, there are three constellations of note: Cygnus, Lyra, and Aquila are typical Summer constellations. If you would like to know more about what you can see during the Summer months, have a look at our Summer info-graphic.